"“I see an oath sworn with deep magic. I see seven hands resting on a book. And I see a name for that book.” A smile spread across her face, as if what she saw amused her. “It is called... the Grimmery.”"
Anton Macquarie is having a bad day. He woke up with a pounding head. He was late for work. He was attacked by a homeless woman with an apple core. His boss’ house was burnt down, his boss is now dead, and his replacement is going to turn the newspaper he works for into a sensationalist tabloid. He can’t remember a month of his life. And, to top it all off, he can’t find his tie. But when his dead boss appears to him as a ghost and tells him to investigate some mysterious fires happening recently, Anton realises there may be more to his missing month than he first suspects. Pieces fall into place, and he realises that he, and others, were a part of an organisation dedicated to containing the occult and defending the innocent, the Grimmery. Ten Thousand and One Spirits have broken free and are beginning to wreak havoc on the city. The book of wisdom and magic the Grimmery was founded on is missing. They are the only ones left who can recapture the Spirits, and they don’t even know what they are capable of doing. If only they could remember that they’ve already locked them away before . . . Updates once in a really, really scary, red-eyed moon. The Grimmery has not been tagged yet. 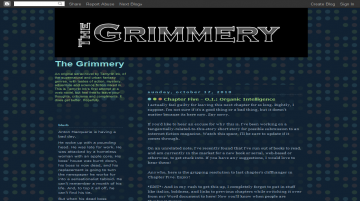 Help others find The Grimmery by tagging it! The Grimmery has not been reviewed yet. The Grimmery has not been recommended yet.